It's been barely a month since I reviewed the 2010 version but, the 2011 version has already arrived. 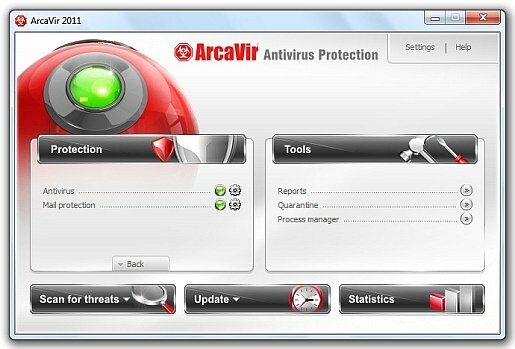 New to ArcaVir 2011 is a revamped interface, many new variants (i.e. internet security, home protection; in fact there are 4 in all ) and a general increase in performance. The program definitely has a more lightweight and mainstream feel to it. Hopefully, these and many unreported changes will alleviate some of the problems (incorrect translations and a general beta feel) in the previous version. The installation of ArcaVir 2011 was mediocre. The test computer had a previous version installed on it and it wouldn’t accept the new version. This was due to the fact that the uninstaller didn’t remove the original Windows services. Therefore, I had to install ArcaVir 2011 on a 32bit test computer. However, the uninstall problems appear to have been fixed in ArcaVir 2011. Once the installation completed the program immediately launched and didn’t require a restart. The interface has completely changed and it definitely has a more Norton like feel to it. ArcaVir 2011 seems significantly more smooth and now is actually faster than most free antivirus competitors. There are now two scanning options the quick scan and the full system scan. The quick scan appears to scan the ArcaVir folder, web browser folders (IE and firefox), user folders, and then the windows and system32 folders. The quick scan took approximately 30 seconds to complete. The full system scan brings up an additional dialog box where one can create scanning profiles. ArcaVir 2011 scans files at approximately 115 files or 3 megabytes per second. This is on par with most free antivirus. 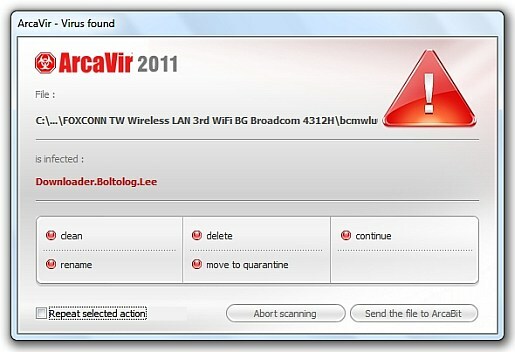 ArcaVir detected the virus Downloader.Boltolog.Lee on the test system. ArcaVir 2011 memory usage has significantly improved. The program uses 5 to 7 processes and about 60 megabytes of memory while idle and surprisingly remains the same while scanning. Cpu usage during scanning is on par with other free antivirus at about 10 to 15 percent. I think it’s quite amazing that ArcaVir went from a fairly clunky antivirus to a polished one in such a short amount of time. The settings menu has been completely revamped and now has a sliding effect to it. There are also more settings available like settings profiles, disabling system restore during a scan, quick scans on startup, the molecule function, very extensive mail scan settings (particularity mass mail protection so that a spambot can’t take over a system), and password protection. All and all, ArcaVir 2011 has significantly improved from previous versions and now mirrors mainstream free antivirus in features and performance.